Affixed to the wall near the city gate in the town of Dubrovnik on Croatia’s beautiful Dalmatian Coast, is a map showing the scale of damage the city suffered during the Croatian War of Independence (1991–1995). The black triangles denote damaged roof, the red boxes denote fires, and the black dots denote direct artillery hits. The damage has been repaired today, but from high points around the city one can clearly see where the bombs fell from the brightly coloured new roofs. While Dubrovnik recovered, the memory of the conflict lingers elsewhere, and nowhere more than in Kupari, located just 10 km to the east of the city. Kupari was once a hugely popular holiday resort. This holiday village first opened to tourists in 1919 when a Czech investor built the Grand Hotel on the shoreline. In those days Croatia was a part of the newly formed Kingdom of Yugoslavia, having seceded from Austria-Hungary after the end of the First World War. The stuccoed bricked walls, fluted pillars, and neoclassical swirls of the Grand Hotel is a reminder of Croatia’s Austro-Hungarian connection. In the 1960s, Josip Broz Tito, the country’s supreme military commander decided that Kupari was the perfect place to send their army officers on holiday. Over the next two decades five more hotels containing over 2,000 beds were built for officers and their families. Nearby, just around the headland, a campsite was built with three more hotels, villas, and residential houses. Altogether, Kupari’s hotels could accommodate up to 4,500 guests. All the hotels are situated close to the waterline, shrouded in typical Mediterranean greenery, and with direct access to the beach. The camp, situated at a walking distance from the hotels, contained the administration building, a clinic, and other auxiliary structures. Further away from the hotels, at the end of a seaside promenade, is a detached group of amenities including residential buildings and villas and an underground structure where high government officials met. Then, the Croatian War of Independence broke out in 1991. That summer, the Yugoslav People’s Army moved into Dubrovnik and began bombarding the historic city. The JNA had captured virtually all of the peninsulas on the coast of the Adriatic Sea, with the exception of Dubrovnik itself. Over the months and years that followed, Dubrovnik and Kupari were subjected to heavy shelling and artillery fire, the scars of which remain visible till today in Kupari. The biggest hotel, Kupari, was devoured in flames. Pelegrin Hotel was directly hit several times, and its interior was devastated when used for temporary accommodation by the Croatian Army servicemen. After capturing Kupari from the Croatian fighters, the JNA stripped the hotels bare, carrying away everything and anything of value. After the War of Independence, Dubrovnik was rebuilt but Kupari was left bomb-scarred, broken and permanently closed. Last year, the former military resort town was purchased by a private party. 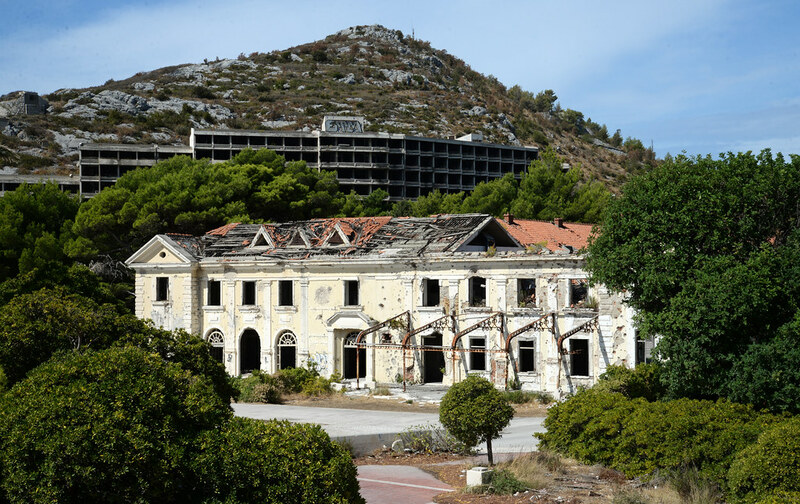 According to The Dubrovnik Times, all the existing hotels in Kupari will be destroyed to make way for a new five-star resort.